52-year old man who was diagnosed with a Diffuse large B-cell lymphoma in the neck in 2012. He received 8 times R-CHOP chemotherapy (including the potential cardiotoxic doxorubicin, and cyclophosphamide). Due to progression of disease he was subsequently treated with a DHAP-VIM-DHAP chemotherapy (including the potentially cardiotoxic chemotherapy ifosfamid) and underwent a bone marrow transplantation after which the disease was in complete remission. He presented himself with signs of severe heart failure (NYHA class IV/IV) after a longer period of dynpea complaints. He was admitted with left sided decompensation with sings of congestion on the chest X-ray and an elevated BNP. The echocardiogram and MRI are discussed below. An additional coronary angiography ruled out coronary artery disease. He was diagnosed with a chemotherapy induced heart failure, clinically recompensated and treated with heart failure medication. It is unknown whether this is a late effect of the chemotherapy or that (more likely) LV function was already impaired after the R-CHOP chemotherapy, since no cardiac screening was performed in this patient. 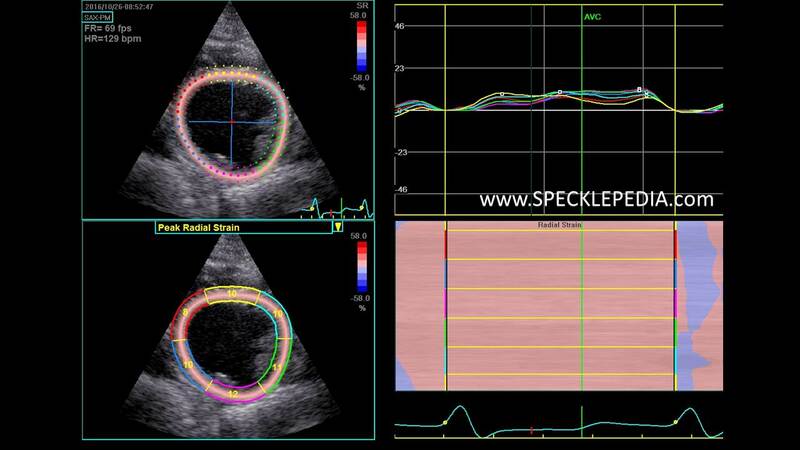 The LV is dilated with a LVIDd of 63mm with overall thin walls. There is global hypo to akinesia. The LVEF is very poor with an LVEF of <10%. 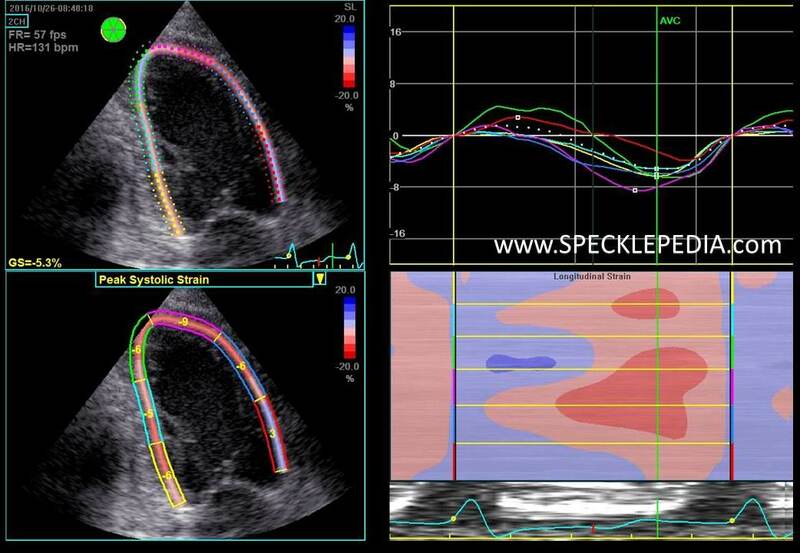 Not the beat to beat variation of the stroke volume (VTI over the aortic and mitral valve). 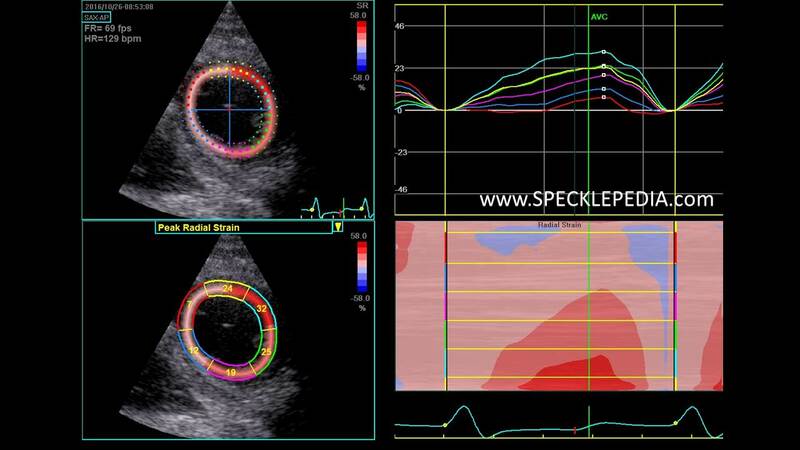 Diastolic function is restrictive. The RV function is moderate at most. There is no significant valvular disease. The global longitudinal strain was calculated at -3.7% during the heartbeats with the “higher” output. 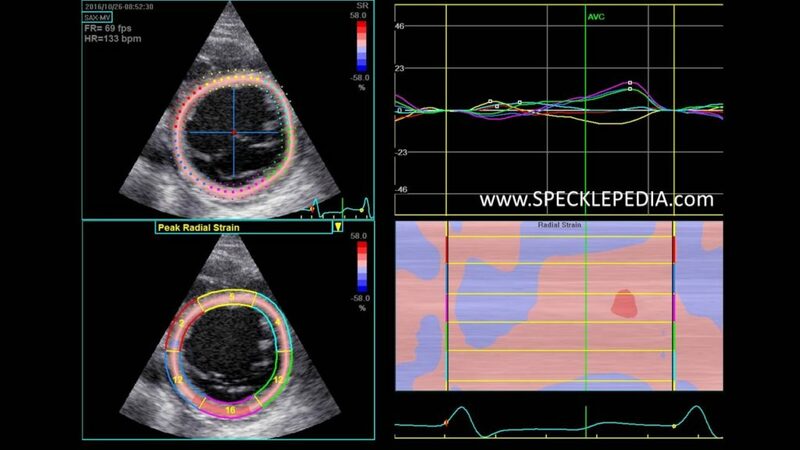 The longitudinal strain is 0% in the other heartbeats with the low output state, as assessed by the VTI over the aortic valve. Note the severe loss of longitudinal strain in almost all segments. In most segments the strain is positive. The amount of post systolic shortening is moderate to absent. 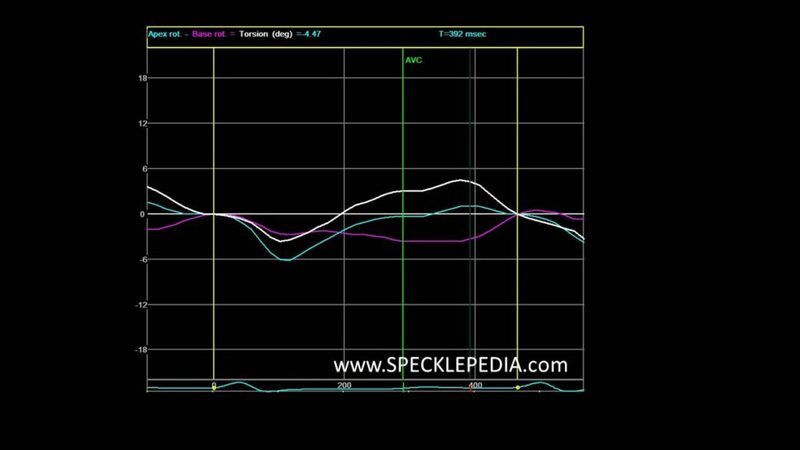 Also due to the long isovolumetric contraction, the systolic time is very short (also see the the pulsed wave recordings above). The diastolic phase is very brief due to the tachycardia and the prolonged IVRT. 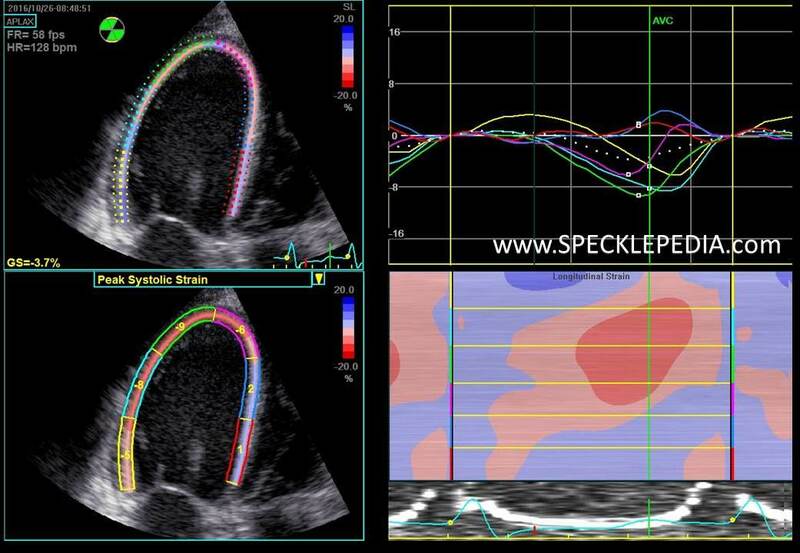 The strain pattern is very a specific for this condition and is virtually indistinguishable from other forms of end stage heart failure: global loss of function and some preservation of deformation in the posterior wall. 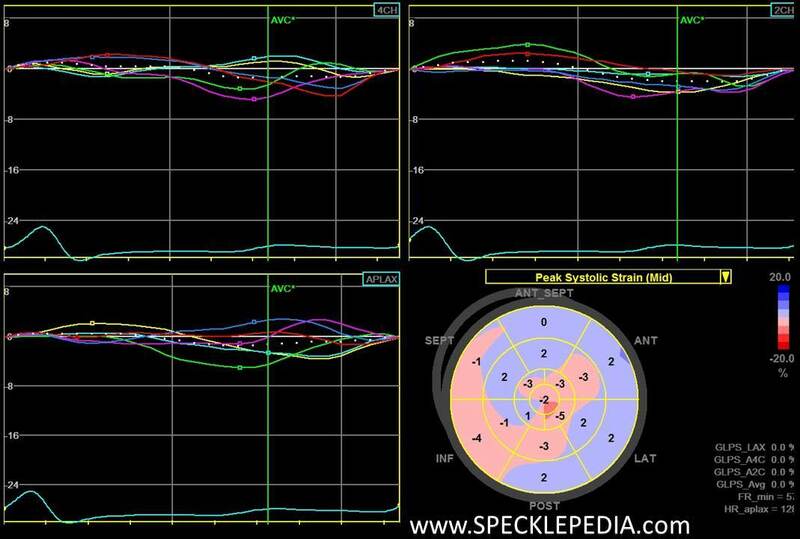 In the views below the radial strain in the short axis views is presented from apex to base. 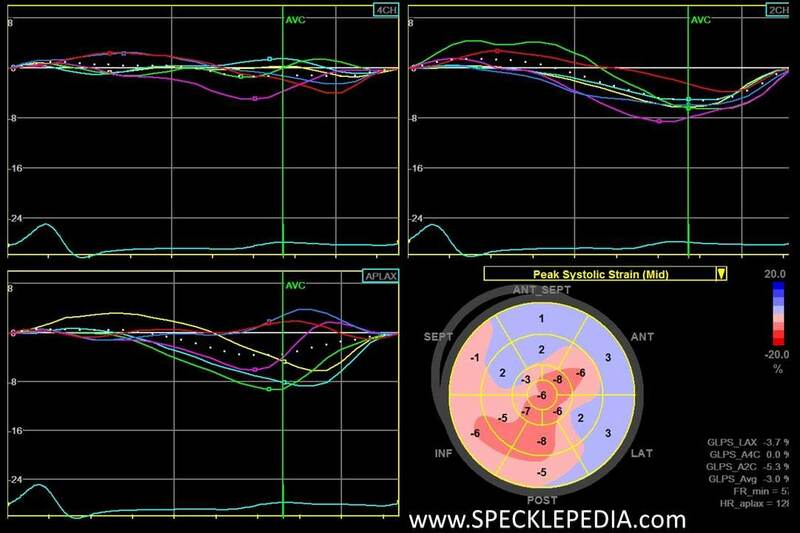 The radial strain is also globally reduced in all segments with some remaining function in the anterolateral apex and the inferopeosterior wall, corresponding to the remaining longitudinal function seen in the deformation graphs above. There is an almost complete loss of torsion-twist in the final graph. 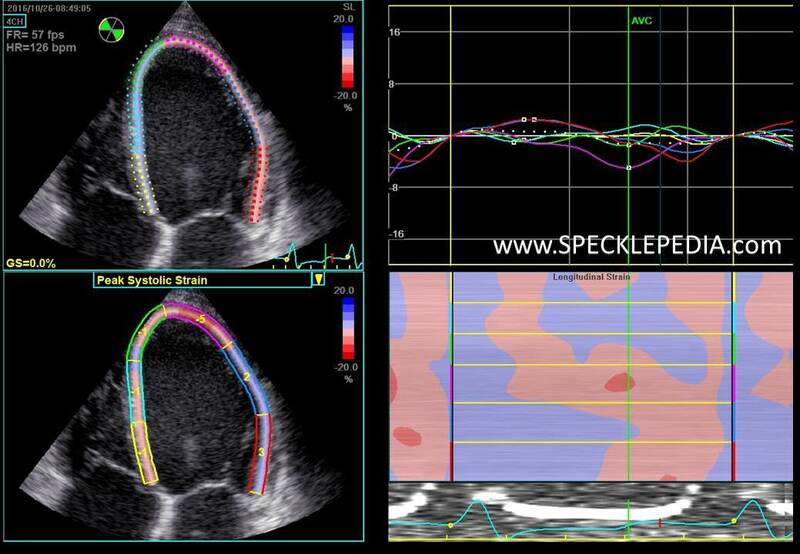 Increased LV end diastolic volume of 360 ml (175 ml/m2) with a bad LV systolic function. LVEF 19% based on global hypokinesia. There is a (dubious) non-significant amount of delayed enhancement in the septal wall, mid-myocardial. The elevated native T1 values and increased ECV of 32% suggest diffuse interstitial fibrosis.